very candy like instead of watermelon like. I feel like real watermelons have a nice sweetness and subtle ness to them. They really should be refreshing and water like. But this e-liquid verision just reminded me of a candy. Kind of reminds me of a very sweet watermelon fresca. It has a great refreshing taste and perfect for an all day vape. I do not get sick of this watermelon flavor one bit. I will continue to pick this one up! Very candy like which is what I was looking for. Something sweet and easy to vape. My girlfriend really likes this one too. We will be buying this one again and hoping to have other candy like flavors in the future. My friend turned me onto this one because she has been telling me how good it is. And I agree! I have had no issues with ordering. 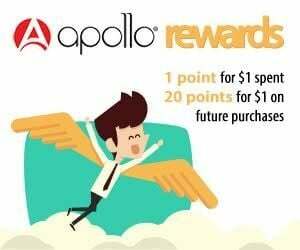 Everything always goes smoothly and Apollo always has good discounts. I think the flavor is very candy like. Really spot on watermelon flavor. I wanted it to taste a bit more like real watermelon though. It is a little more on the candy side but still pretty good and easy to enjoy and smooth to vape. My favorite thing is that it is smooth. That is the most important thing to me. Nice flavor and vapor production. I like that it has a sweetness to it. I get bored of flavors that taste too plain. I have been doing the 50mg and liking it. I also use the Sourin device when using this flavor since it is higher in nicotine. Glad Apollo has made salt nics. I really like this Watermelon Salt e-liquid. I like the sweet taste of the watermelons. I like that it doesn't seem harsh as well. It is pretty refreshing actually to vape this one. I just got my package today and was very excited to try this one. Hoping it will continue to taste great as time goes on. I love how sweet and fruity this one is. It is more of a candy watermelon flavor and it also super refreshing. I do not get tired of this one at all and I have been vaping it for a week or so now. Will be buying this one again and again! Shipping is very quick as well which I appreciate tremendously. I have been loving the watermelon salt. It is seriously incredible. Not harsh at all like some other salts that I have tried. It is super smooth and very candy/fruity. I could vape this all day long and not get sick of it at all! You really get the taste of watermelon on the inhale and the exhale. Can't get enough..